When everyone lies, who can you trust? Judy Hudson has no idea of her power, or vulnerability. Adrift without purpose, or ambition, all she knows is fear and suspicion. That is about to change. Purah—a beautiful, otherworldly stranger—whisks her to a mysterious, old mansion and reveals a life-changing secret. Judy is a witch who can raise the dead. She's dangerous, and she can do great harm. But her's is not the only secret in Winterhurst. A powerful sorcerer is waiting for her and the perfect moment to strike. He must be stopped before an innocent town is destroyed. As Judy discovers her identity and heritage, she learns she is the key to stop an ancient evil. Can she learn to harness her gift, and resist a lure that promises power beyond her wildest dreams? This suspenseful, character-driven, urban fantasy will keep you hooked until the last page. Order your copy today! 5.0 out of 5 starsRavens WOW! As debut novels go, you can not go past this one! 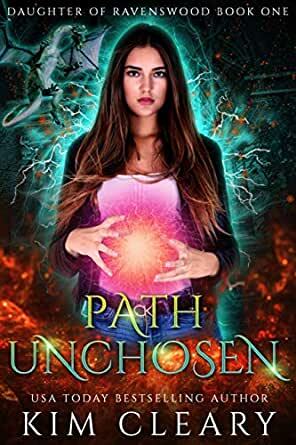 Cleary captivates her reader and draws them into her fantastical world with well developed characters who you feel like you've known all your life. A magical world awaits you. Looking forward to reading the second book in this series! A great first novel. Kept me entertained the whole way through. Can't wait to read the second book. That was intense! I practically read all day even when l was tired l couldn't go to bed until the whole story unfolded. I am impressed with this authors story, I hadn't read any of her books before. There is an old witch lm a bit concerned about, l dont reakon we have heard the last of her. Or the spirit or violent ghost. Just have to read on l guess. This book had me from the start and I couldn't put it down. Characters are all full of life in one way or another. Can't wait to read the next book. What a great book, great character development and a story that gets you hooked from the beginning!